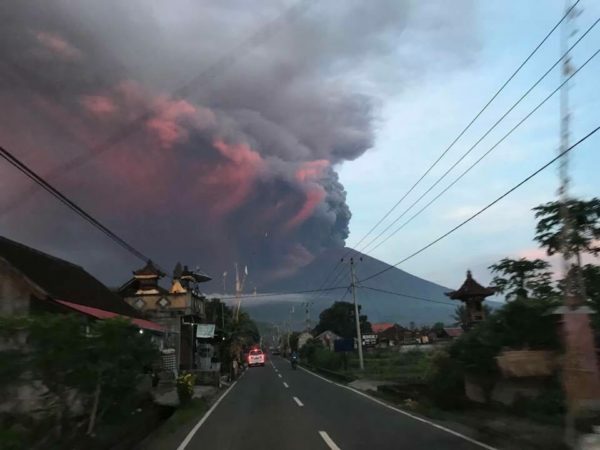 Volcano alert in Indonesia, tourists stranded in Bali – Royal Times of Nigeria. Indonesia raised its warning for Bali’s Mount Agung volcano to the top level four alert on Monday, closed the holiday island’s airport and told residents around the mountain to immediately evacuate, warning of an “imminent” risk of a larger eruption. Bali’s airport was closed for 24 hours from Monday morning, disrupting 445 flights and some 59,000 passengers, due to the eruption and the presence of volcanic ash from Agung, but local officials said the closure could be extended. Video footage shared by the disaster agency showed cold lava flows (lahar) at a number of locations on the mountainside. Lahar carrying mud and large boulders can destroy houses, bridges and roads in its path. “The potential for a larger eruption is imminent,” it said, referring to the visible glow of magma at Agung’s peak overnight. Residents were warned to “immediately evacuate” a danger zone that circles Agung in a radius of 8-10 km (5-6 miles). Sutopo, a BNPB spokesman, said there had been no casualties so far and 40,000 people had left the area, but tens of thousands still needed to move and warned authorities would move them by force if necessary. Agung rises majestically over eastern Bali to a height of just over 3,000 metres (9,800 feet). Eastern Bali is relatively undeveloped, with traditional rice paddies doting the landscape and the occasional budget resort, unlike the heavily populated southern tourist hub of Kuta-Seminyak-Nusa Dua. Agung’s last eruption in 1963 left more than 1,000 people dead and razed several villages. Analysis suggested the threat should not be as great this time because “energy at Mount Agung’s magma chamber is not as big” and with the ash column only around a quarter as high so far as the 20 km (12 miles) reached in 1963, said Sutopo. “I‘m not worried (but) my friends in Russia are a little bit,” said a Russian tourist, who only wanted to be identified as Dmitry, at an observation post in Rendang in Bali’s east. Bali, famous for its surf, beaches and temples, attracted nearly 5 million visitors last year, and its international airport serves as a transport hub for the chain of islands in Indonesia’s eastern archipelago. Tourism business has slumped in Bali since September when Agung’s volcanic tremors began to increase.